Apollo Engine is a commercial product produced by MDG, the Meteor Development Group, the company behind Apollo. It provides many great features, which we’ll explore in this article. We will also answer these questions using the Apollo Engine: How is our GraphQL API performing, are there any errors, and how can we improve the GraphQL schema? This article is taken from the book Hands-on Full-Stack Web Development with GraphQL and React by Sebastian Grebe. This book will guide you in implementing applications by using React, Apollo, Node.js, and SQL. By the end of the book, you will be proficient in using GraphQL and React for your full-stack development requirements. To follow along with the examples implemented in this article, you can download the code from the book’s GitHub repository. First, you need to sign up for an Apollo Engine account. At the time of writing, they offer three different plans, which you can find by going to their plans page. When signing up, you get a two-week trial of the Team plan, which is one of the paid plans. Afterward, you’ll be downgraded to the free plan. You should compare all three plans to understand how they differ—they’re all worth checking out. To sign up, go to its login page. Currently, you can only sign up using a GitHub account. If you don’t have one already, create a GitHub account. The next step is to add a service with the NEW SERVICE button in the top-right corner. The first thing you need to enter is a unique id for your service across all Apollo Engine services. This id will be auto-generated through the organization you select, but can be customized. npx apollo service:push --endpoint="http://localhost:8000/graphql" --key="YOUR_KEY"
The preceding endpoint must match your GraphQL route. The key comes from Apollo Engine itself, so you don’t generate it on your own. Before running the preceding command, you have to start the server, otherwise, the GraphQL schema isn’t accessible. Once you’ve uploaded the schema, Apollo Engine will redirect you to the service you just set up. Ensure that you remove the introspection field when deploying your application. If you aren’t able to run the GraphQL server, you also have the ability to specify a schema file. Once you publish the GraphQL schema, the setup process for your Apollo Engine service should be done. We’ll explore the features that we can now use in the following sections of this article. Before doing this, however, we have to change one thing on the back end to get Apollo Engine working with our back end. We already used our API Key to upload our GraphQL schema to Apollo Engine. Everything, such as error tracking and performance analysis, relies on this key. We also have to insert it in our GraphQL server. If you entered a valid API key, all requests will be collected in Apollo Engine. Verify that everything is working by running some GraphQL requests. You can view all past requests by clicking on the Clients tab in Apollo Engine. You should see that a number of requests happened, under the Activity in the last hour panel. If this isn’t the case, there must be a problem with the Apollo Server configuration. On the page, you see the last GraphQL schema that you have published. Each schema you publish has a unique version, as long as the schema includes changes. Beneath the version number, you can see your entire GraphQL schema. You can inspect all operations and types. All relations between types and operations are directly linked to each other. You can directly see the number of clients and various usage statistics next to each operation, type, and field. You can search through your GraphQL schema in the top bar and filter the usage statistics in the panel on the right. You can also switch to the Deprecation tab at the top. This page gives you a list of fields that are deprecated. We won’t use this page because we are using the latest field definitions, but it’s vital if you’re running an application for a longer time. Having an overview of our schema is beneficial. In production, every new release of our application is likely to also bring changes to the GraphQL schema. 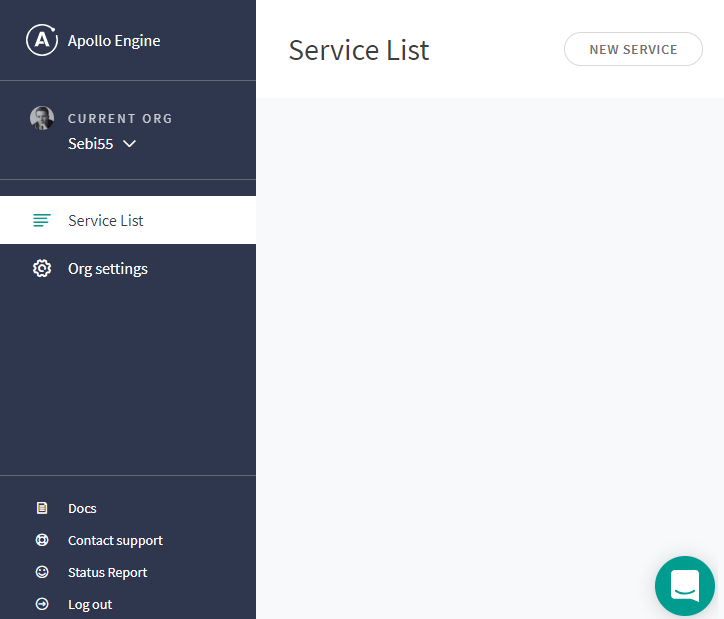 With Apollo Engine, you can track those changes easily. This feature is called schema-change validation and is only included in the paid Team plan of Apollo Engine. It’s worth the extra money because it allows you to track schema changes and also to compare how those fields are used. It allows us to draw conclusions about which clients and versions are being used at the moment. Here, I published an initial version of our current GraphQL schema. Afterward, I added a demonstration type with one field, called example. On the right-hand side, you can see the schema difference between the initial and second releases of the GraphQL schema. Viewing your schema inside Apollo Engine, including the history of all previous schemas, is very useful. When your application is live and heavily used, you can’t check the status of every feature yourself; it would lead to an impossible amount of work. 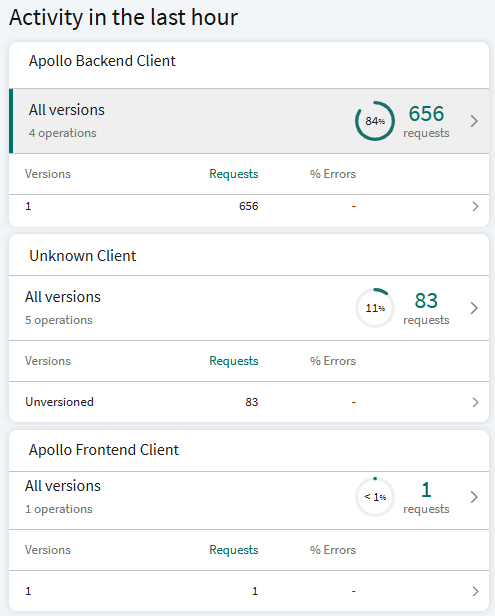 Apollo Engine can tell you how your GraphQL API is performing by collecting statistics with each request that’s received. You always have an overview of the general usage of your application, the number of requests it receives, the request latency, the time taken to process each operation, the type, and also each field that is returned. Apollo Server can provide these precise analytics since each field is represented in a resolver function. The time elapsed to resolve each field is then collected and stored inside Apollo Engine. If your GraphQL API is running for more than a day, you’ll receive an overview that looks like the one here. The left-hand graph shows you the request rate over the last day. The graph in the middle shows the service time, which sums up the processing time of all requests. The right-hand graph gives you the number of errors, along with the queries that caused them. Requests Per Minute (rpm): It is useful when your API is used very often. It indicates which requests are sent more often than others. Latency over time: It is useful when the requests to your API take too long to process. You can use this information to look for a correlation between the number of requests and increasing latency. Request-latency distribution: It shows you the processing time and the number of requests. 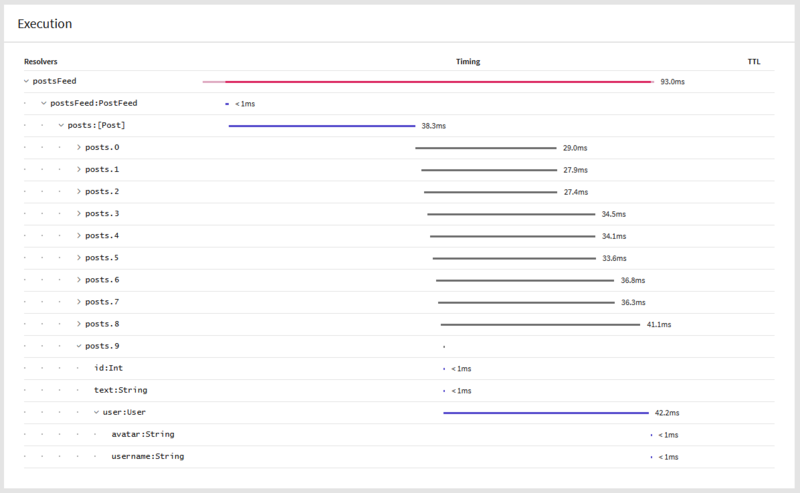 You can compare the number of slow requests with the number of fast requests in this chart. In the right-hand panel of Apollo Engine, under Metrics, you’ll see all your GraphQL operations. If you select one of these, you can get even more detailed statistics. The latency distribution chart shows all the different latencies for the currently-selected operation, including the number of sent requests with that latency. In the preceding example, I used the postsFeed query. The execution timetable is a big foldable tree. It starts at the top with the root query, postsFeed, in this case. You can also see the overall time it took to process the operation. Each resolver function has got its own latency, which might include, for example, the time taken for each post and user to be queried from the database. All the times from within the tree are summed up and result in a total time of about 90 milliseconds. It’s obvious that you should always check all operations and their latencies to identify performance breakdowns. Your users should always have responsive access to your API. This can easily be monitored with Apollo Engine. In this tab, you can directly see the percentage of errors that happened during each operation. In the currentUser query, there were 37.14% errors out of the total currentUser requests. If you take a closer look at the left-hand side of the image, you will see that it says, Unidentified clients. Since version 2.2.3 of Apollo Server, client awareness is supported. 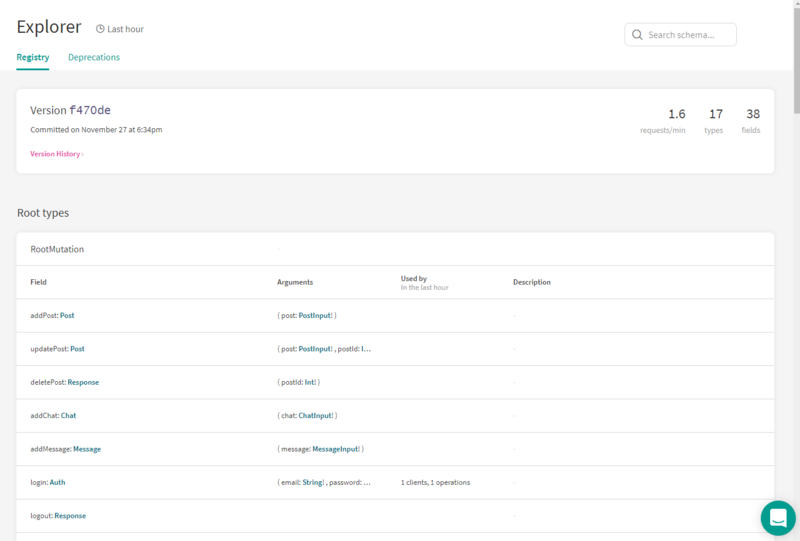 It allows you to identify the client and track how consumers use your API. Apollo automatically extracts an extensions field inside each GraphQL operation, which can hold a name and version. Both fields—Name and Version—are then directly transferred to Apollo Engine. We can filter by these fields in Apollo Engine. We will have a look at how to implement this in our back end next. The generateClientInfo function is executed with every request. We extract the two fields from the header. If they exist, we return an object with the clientName and clientVersion properties that have the values from the headers. Otherwise, we return a static Unkown Client text. Open the index.js file of the client’s apollo folder file. Like AuthLink, this link will add the two new header fields next to the authorization header. It sets the version header to '1' and the name of the client to 'Apollo Frontend Client'. We will see both in Apollo Engine soon. Add InfoLink in front of AuthLink in the ApolloLink.from function. The link is almost the same as the one for the front end, except that we set another apollo-client-name header. Add it just before AuthLink in the ApolloLink.from function. At the top of the screenshot, we see the number of requests the back end has made. In the middle, all the clients that we have no further information on are listed, while at the bottom, we can see all requests that have been made by the client-side code. Unknown clients might be external applications that are accessing your API. When releasing a new version of your application, you can increase the version number of the client. The version number represents another comparable field. We now know which clients have accessed our API from the information provided by Apollo Engine. Let’s take a look at what Apollo Engine can tell us about errors. The first chart shows the number of errors over a timeline. Under the graph, you can see each error with a timestamp and the stack trace. You can follow the link to see the trace in detail, with the location of the error. 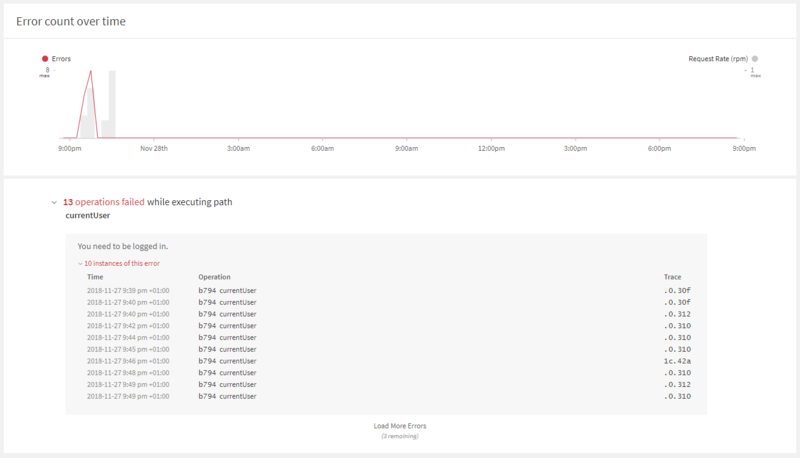 If you paid for the Team plan, you can also set alerts when the number of errors increases or the latency time goes up. You can find these alerts under the Integrations tab. This article walked you through how to sign up to and set up Apollo Engine. Further, we will learn how to analyze schemas, check how our GraphQL API is performing, and track errors using Apollo Engine. If you found this post useful, do check out the book, Hands-on Full-Stack Web Development with GraphQL and React. This book teaches you how to build scalable full-stack applications while learning to solve complex problems with GraphQL.